Facts: Surveys show that the number 1 dilemma for people who want to be in business is "lack of ideas" closely followed by "where should I start once I've got an idea?" By FRISK Commercial "Idea Place"
Founded in 2008, we have gathered many Unique Business Ideas in the year 2008-2009. They have become the Ultimate Guide to Unique Business Ideas 2008-2009, that we called it "Brainstorm Bible of Potential Business." We highly recommend you to have it. In the beginning of the year of 2010, all of the Unique business Ideas that we submit in our blog will stays here for you to enjoy your FREE reading articles. We will try to provide you with the best unique business ideas at IdeBisnisUnik.com (IBU). Ideas that mean business ... and more business. We believed you'll enjoy reading these examples of entrepreneurship with a twist, and we hope that they inspire you in your own business endeavors. As our motto, ideas inspire more ideas … So now you can start to create, modified better or even copy these amazing, wild, crazy, exciting and unique business ideas at IdeBisnisUnik.com. Thank you all :-). For people who don't have time to bathe or access to fresh water, a South African college student has a solution: a shower gel users simply rub onto their skin. One small packet replaces one bath, and users never need any water. Ludwick Marishane's inspiration was a lazy friend in the need to bathe, but his invention will be a boon to people who live in areas where clean water is in short supply. The gel, called Drybath, kills germs, moisturizes the skin and exudes a pleasant, light smell, unlike hand sanitizers, according to Marishane's website, Headboy Industries. The gel is packaged in small, easy-to-open sachets that were a South African invention. Marishane got the idea to sell individual packets when he learned from mentors that the world's poorest people buy things in very small quantities, such as one cigarette at a time as opposed to a pack or a carton, he said in a presentation. In poor communities, Marishane said he sells Drybath for 50 cents a packet, according to an interview with the Global Student Entrepreneur Awards. (Marishane won the competition's top prize in December 2011). 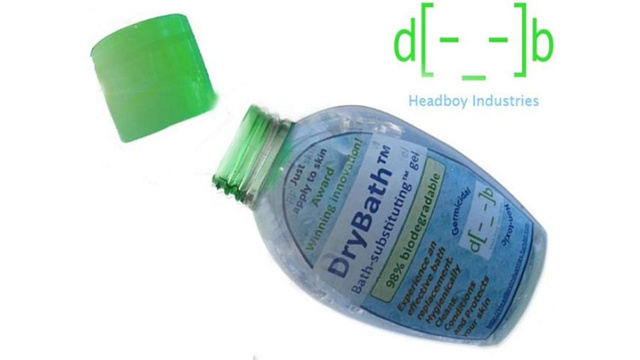 For corporate customers, such as airlines or hotels, each Drybath packet costs $1.50. Marishane donates one packet to charity for every corporate packet sold. Marishane wants the company he founded, Headboy Industries, to become a "huge conglomerate" comparable to GE, while developing novel products for the world's poorest people, he said. It’s not uncommon for hotels to extend frequent customers the courtesy of a late check-out option, but Starwood Hotels & Resorts Worldwide recently announced an initiative that takes that premise even further. Now available to top-tier members of the company’s loyalty program, Your24 is a new service that lets guests choose their own check-in and check-out times. The Starwood Preferred Guest loyalty program offers three membership levels based on how often guests stay at the company’s hotels. Focusing on members in the top-tier Platinum level, the new Your24 service is available to those who have spent 75 nights or more at a Starwood Hotel. In such cases, members can now pick their check-in and check-out times, so that a member who chooses to check in at 10pm on one day, for example, won’t have to check outuntil 10pm on their day of departure. The hotel hopes that the new initiative will ensure guests are able to enjoy a more leisurely stay over a 24 hourperiod, regardless of when they arrived. We came across something we hadn’t seen before. 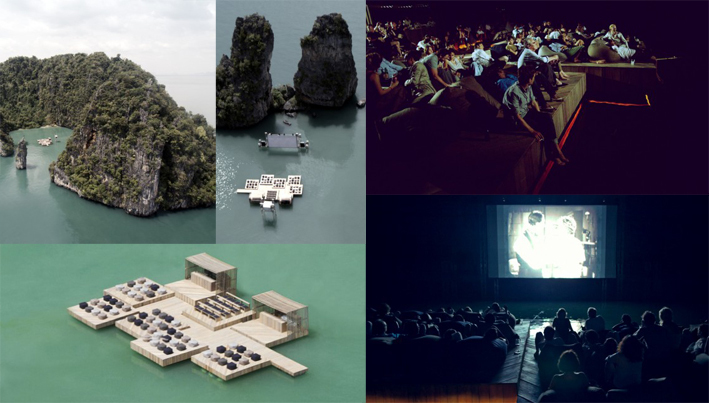 The Archipelago Cinema by Beijing-based architectural firm Buro Ole Scheeren, which has brought movies to the sea. Premiering at the inaugural edition of the annual Film on the RocksYao Noi Festival, curated by Apichatpong Weerasethakul and Hollywood actress Tilda Swinton, the floating cinema consisted of a mobile auditorium installed on a group of modular rafts. The pieces were towed out to the Nai Pi Lae lagoon off the coast of Kudu Island, with another raft housing a screen placed into position. Much like a drive-in cinema, festival-goers then rowed out to the scenic location for the screening. As well as being an intriguing architectural design for the movie experience, German-born Ole Scheeren ensured that the rafts were made from locally-sourced recycled materials using local techniques— the island’s lobster farmers use similar rafts to catch their produce. Following the end of the festival, the rafts pieces will be used in other locations as a cinema on water, before being given back to the local community to use as stages or playgrounds until next year’s celebrations. The Archipelago Cinema brings a unique spin to the pop-up cinema trend and locally-sourced materials ensure that it is sustainable and beneficial to the area in which it operates. Certainly one to inspire a similar project. 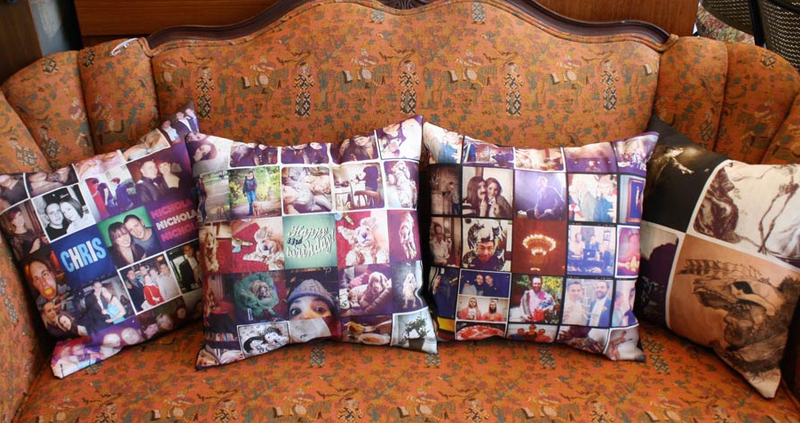 Stitchtagram make throw pillows out of your Instagram photos. They make really great gifts and are fun to have around your home. Why do they think anyone needs an item like this? Because they believe that the internet is not enough for your memories. It's a shame when great and memorable photos fall off your Instagram feed, never to seen again. Their pillows let you keep your photos alive by bringing them out into the real world, to be enjoyed every day. These are going to last longer than your iPhone, and are much more comfortable to take a nap on. The photos are digitally printed on a linen-cotton canvas. The pillow back is a dark navy color with an envelope-style closure, which they hand sew in Washington, DC. The 15 inch pillows come complete with a soft and fluffy removable insert. Now you can start creating some business ideas what can you do to connect people in their online world with their offline lives. Have a craving for donuts? The Doughnut Vault in Chicago’s River North neighborhood may not be your best bet for some deep-fried goodness. Housed in an old bank vault, the shop is open at 8:30 AM Tuesdays through Fridays and 9:30 AM on Saturdays for a very small window of time. Once the last donut is sold the blue doors are shuttered, which typically an hour or two after opening. Opened by restaurateur and chef, Brendan Sodikoff – of Per Se and Alain Ducasse kitchen. The Doughnut Vault is a thriving business selling coffee and around 600 hundred donuts aday, creating a buzz and viable business off of scarcity. How would you like to work in an office like this? Dufaylite, makers of a 100% recyclable, robust and versatile core material (recycled paper honeycomb) partnered with Leeds-based Duke Studios for a truly unique workspace environment. 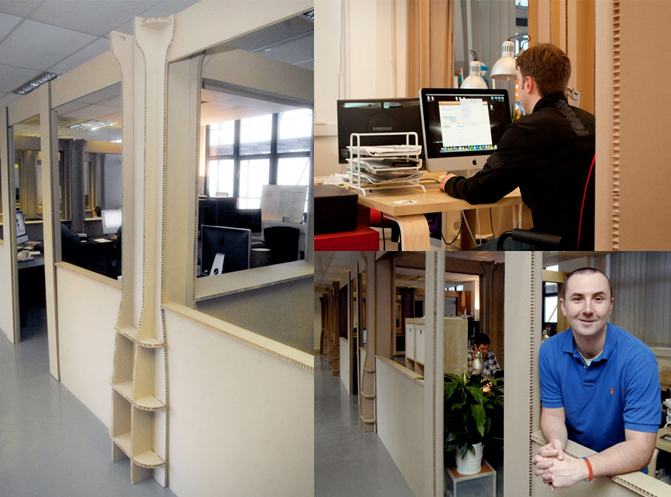 They created ten studio offices using their substrate material called Ultra Board. Located in Leeds, Duke Studios is bringing some fun and life back to an old building by transforming all 7000 square feet it into an open floor plan studio space for creatives. This place already looks like tons of fun! Designed by Emanuele Magini for Campeggi, it's just a simple chair with net wrapped around the legs. While dead easy, that little tweak just turned the chair into a proper goal --one that I'm optimistic can make for hours of fun (and broken stuff) with a soccer ball and lots of imagination. Presented at the Milan Design Week 2012, the Lazy Football Chair is made from metal and dressed in plain white paint. The distance between the front legs of the chair has been widened to accommodate the encouraged game play, with a metal base connectingall of the legs for increased stability (so the chair doesn't fall off when you hit a goal too hard). The creator encourages a seated game of 1-on-1, where you each try to kick a ball into the other person's goal. Gotta love Resource Furniture, they really understand how to do space-saving in style. One of the latest items they’ve introduced has immediately caught my eye. 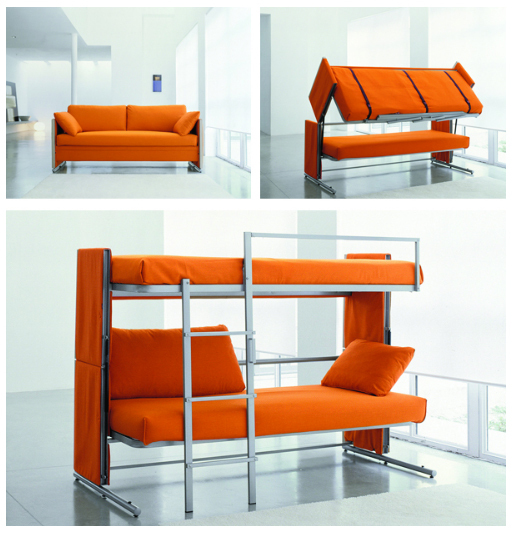 DOC sofa by Bonbon isa clever transformer, capable of serving as a fully functional bunk bed. Perfect for a living room or a home office, the item can turn any space into a spear bedroom for two. The transformation is simple, requires zero muscle and fuss. Flash2Pass turns your existing headlight high beam switch into a transmitter for your automatic garage door opener. It is necessary to flash it twice, once to power the radio frequency transmitter that is hidden under the hood, and the second time to send the radio signal to open or close the garage door. Hence the number “2” in the name. Works with virtually any vehicle with a 12-volt system. 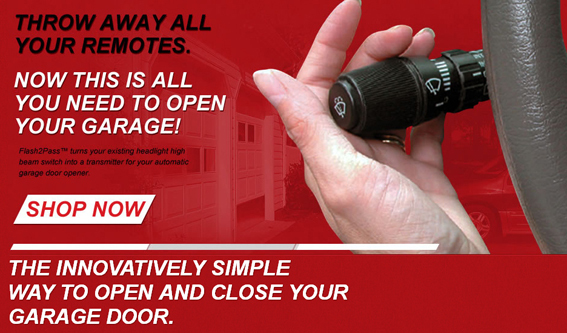 Works with most automatic garage door openers manufactured since 1982. Easy do-it-yourself instructions included. Can be installed in less than 15 minutes with standard household tools. ABC News reports many general practitioners (GPs) do not have GPs themselves, but that is about to change in South Australia where a clinic specifically for doctors is being setup. It is also hoped the clinic will help overcome problems which arose from a law that requires doctors to report colleagues who are sick. Dr Roger Sexton will be one of 15 doctors who will work at the clinic, on the southern fringe of Adelaide’s CBD, when the doors open in a fortnight. He has been driving the world-first project for years. “There are doctors who are quite happy seeing other doctors, and other doctors who may be a little bit uncomfortable about it,” he said. ”Those doctors who don’t have their own doctor clearlyneed something more than just their own treatment.” The clinic is being fittedout in what was a neurologist’s office. It will open for four hours, two nights a week and all day on Saturdays to fit around normal working hours for doctors seeking a check-up. It has developed special solutions to support and encourage all doctors to have their own doctor. Good manners are very important, since manners are a significant part of communication throughout life, and etiquette lessons educate children on how to be respectful and put up with situations that may not be naturally easy to handle without proper etiquette training. Although they may not immediately understand the value and positive outcomes of learning good manners, attending etiquette courses can help to instill many essential qualities in children. 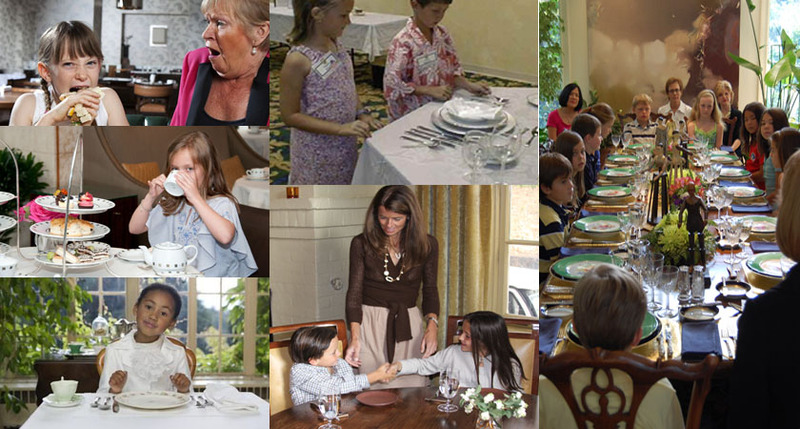 In order to give parents a helping hand, the Kensington Hotel are running a series of classes to help teach dinner etiquette to young ones, called “Petite Etiquette” with some easy-to-learn tips and tricks for one hour complimentary classes tot each children aged between five and ten a few basic table manners. According to a poll of 2,000 parents with children aged five to ten; worrying about how their tots will behave in restaurants is the biggest cause for stress for nearly a third of parents (28%). They are worried about being left red faced by their children’s table manners. Nearly half (48%) of UK mums and dads admit to being embarrassed by their youngsters when dining out. One in five (19%) have left a restaurant mid-way through a meal because of their kids behaving badly. At The Kensington Hotel, they believe dining as a family should be a relaxing experience, and an opportunity for you to enjoy quality time together. The daughter of fashion billionaire Ralph Lauren, Dylan Lauren runs Dylan's Candy Bar, a chain of upscale candy stores. When Dylan was 16, her famous father asked her if he could use her first name for a new women's perfume he was planning. "I'm saving my name for something I own," she told her dad. Five years after graduating from Duke, she got her chance after she convinced her father to finance a candy store concept she'd come up with, inspired by her favorite film Willy Wonka and the Chocolate Factory. In 2001, Lauren's 15,000-square-foot emporium of gummy bears, lollipops, and chocolates opened on Third Avenue and 60th Street, just a block from Bloomingdale's. She's since expanded to five locations across the U.S. Dylan’s Candy Bar offers more than 5,000 varieties of candies from around the world. Dylan’s Candy Bar on Manhattan’s Upper East Sideis the biggest candy store in the world. Her book, Dylan’s Candy Bar: Unwrap Your Sweet Life, reflects the creative influence of dad Ralph and mom Ricky, and contains everything from candy-entertainingand decorating ideas to candy history to cocktail recipes—including her favorite, a Gummi Bear Martini. Now how many great candy store available in your city or maybe country? We will bet, None! Not many countries have big candy stores with lots of varieties of candy, right? The Swedish company has partnered with an architectural firm to bring customers miniature IKEA wonderlands. Have you ever spent a Saturday afternoon strolling through IKEA, thinking to yourself, “If only I could live at this magical place”? The Swedish company hasn’t begun renting out its showrooms just yet, but it has partnered with Oregon architectural firm Ideabox to launch a line of prefabricated homes. 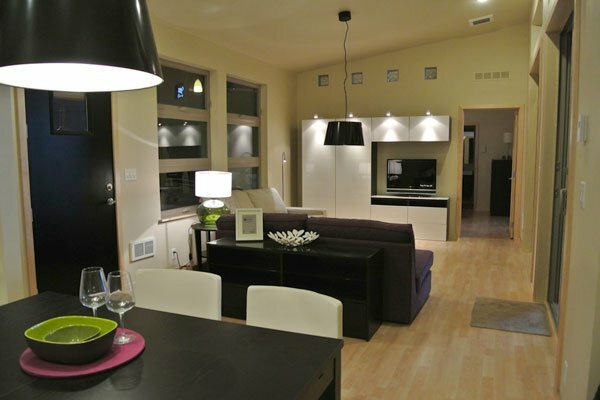 Dubbed “aktiv,” the one-bedroom homes will be decked out entirely in hip IKEA decor. Expected to sell at $86,500, the homes are “Swedish inspired” and “full of personality,” according to the Ideabox website. Here is a soaring example of small space creativity from Parisian architects Emmanuel Combarel Dominique Marrec. This airy-looking 50 m² dwelling used to be an artist studio with an awkward two-level layout. One of the main challenges in this project was to fit an independent bedroom into a limited space. The task has lead to an ingenioussolution – creating a floating cube in the middle of the room. This floatingsleeping island became a focal point of the interior, dividing the floor plan into functional zones without interfering with the flow. The suspended box is made of a metallic structure covered with wooden panels and painted in white to match the rest of the apartment. I love how it truncates the view to both lower and upper levels and creates privacy while preserving openness of the space. Architect James Law designed an unbelievable skyscraping residential complex for real estate company Wadhwa Group in Mumbai, India. One of the most outstanding and eye-popping features of the facility includes a series of swimming pools placed within each balcony. 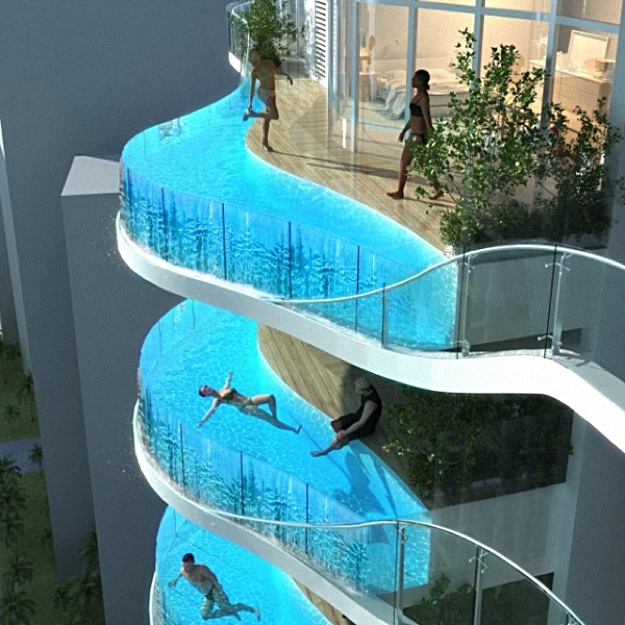 These pools appear like floating gelatinous molds extending at the edge of each apartment’s balcony. Linx were created because I wanted a construction game that was cheap, flexible and light. With LINX you can build everything from ambitious room-sized structures to intricate table-top sculptures, all using LINX connectors and standard drinking straws. LINX are portable, less expensive than anything else around,and ultra light weight, so that even if your mammoth construction falls, no one gets hurt. 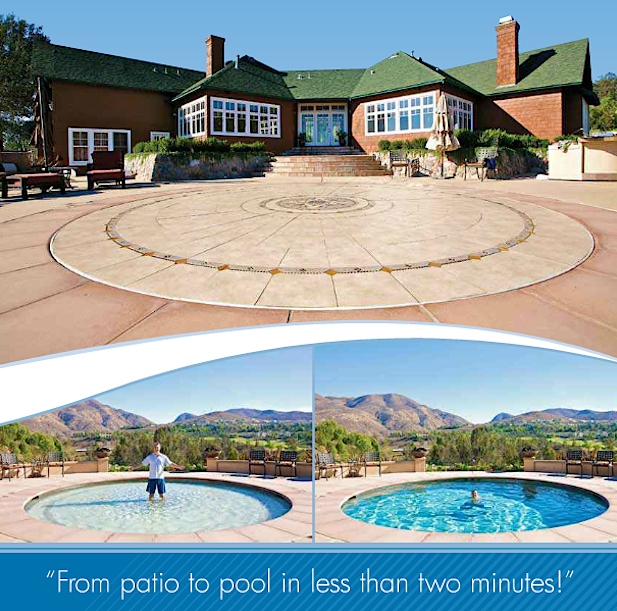 Hidden Water Pools look like traditional pools until the owner presses a button on the attached control panel. Within seconds, hydraulic lifts, powered by the pool’s own water, slowly raise the floor of the pool up. As the pool floor rises, the water flows to the edges where it then drains beneath the pool floor. In a bit more than a minute, the swimming pool is now a decorative patio, just right for entraining, or play. When the party’s over, the patio floor can quickly be lowered back into the pool. The depth of the pool can also be controlled via the control panel. The movable floor allows you to have a swimming pool that is from 1 inch to six feet deep. 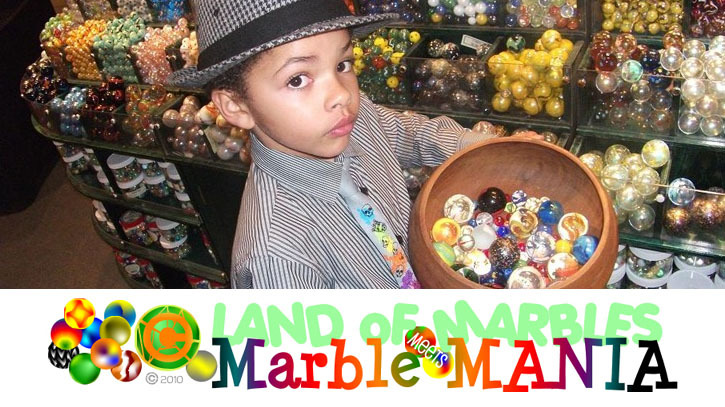 Eight-year-old Harli Jordean, who has been obsessed with marbles since he was six, turned his love for the shiny orbs into a bonafied business at 500 bucks a pop. It was Harli’s obsession with marbles that led him to the web, but he was disappointed to find that there was only a limited selection of his beloved toy. That’s when the budding business mogul got the idea to start his own website. Marble King is now bringing in thousands of dollars per year, with orders rolling in from as far as the U. S.
According to IBJ.com, uFlavor has one basic goal: to become the YouTube of the soda industry. Customers will be able to choose the ingredients for custom-made concoctions and design their own labels, then uFlavor will make and sell the drink—to its creators and the general public, who’ll be asked to rate the finished product. Some undoubtedly will fall flat. Others could be the thirst-quenching equivalent of an especially cute cat video. But it only takes one Honey Badger to get the world’s attention. The first batch of beverages will be delivered in late January, when the process of creating the next round of drinks will begin based on customer feedback. By summer, uFlavor hopes to have perfected the equipment that will allow anyone to design a drink from anywhere.